The Oreo cookie is an American Born Classic. What is your favorite way to eat a Oreo ? 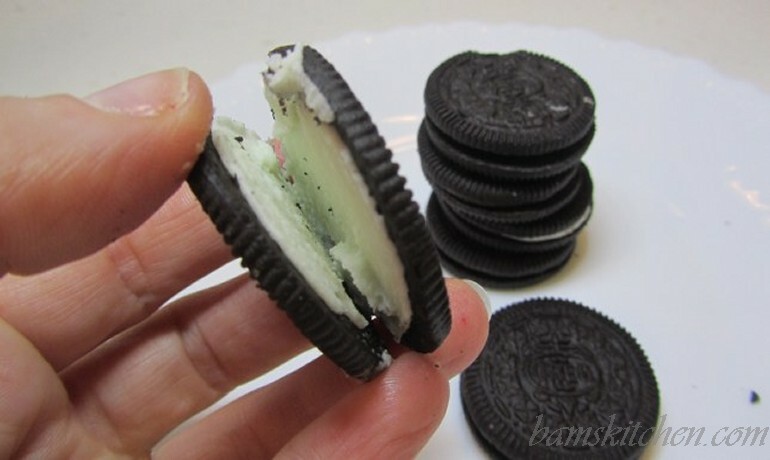 Option B) Pull the cookie apart and lick the white frosting out of the center before dipping your Oreo in milk. According to Kraft, over 50 percent of people if asked will choose option B. Of that 50% of people who choose to split open their cookie, most of them are women. The first Oreo cookie was sold in New Jersey in 1912. These first these cookies were called Oreo biscuits and sold in tins to attract the UK market. Now, there all kinds of Oreos from the double stuff, different kinds of cream fillings and mini Oreo cookies to everything in between. The rich dark crispy chocolate cookie and rich creamy filling of the Oreo cookie can bring a smile to both the young and old. To give the Oreo cookie the proper Birthday send off I promptly poured myself and big glass of cold milk and set aside a few Oreos on a dish. I could not resist, the temptation was too great, I like to split my cookies and lick the filling then take a final dunk in my milk before devouring. I was a kid all over again. However the adult in me was thinking this is quite a yummy cookie and it has all kind of gastronomic potential written all over it. Shall I make a ice-cream mint pie with a Oreo crust? How about chocolate covered Oreos? 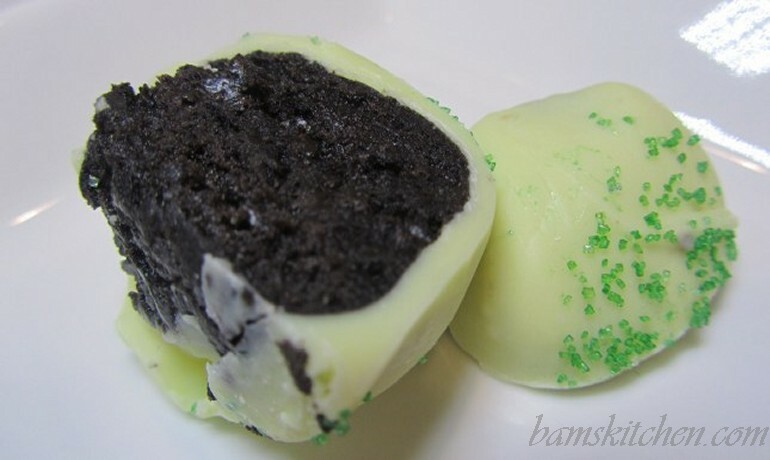 How about a St. Patty's Day Oreo Truffle? Step 4: Break up the white chocolate into small pieces and microwave in oven for just a few seconds or until it starts to melt and stir. (Have a two-year old temper tantrum when your white chocolate seizes up because the humidity level in Hong Kong is 100 percent) Buy some new chocolate and start again this time being very careful to avoid any moisture going into the chocolate, but of course you will never need to worry about this. 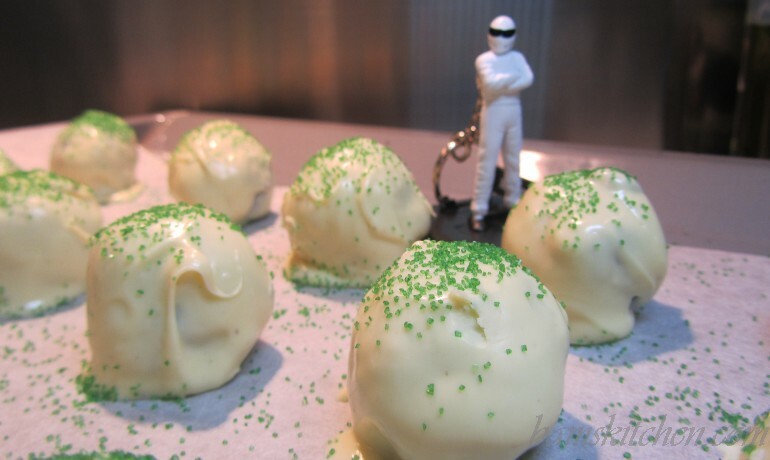 Step 5: Remove Oreo balls from freezer and set up and assembly line. 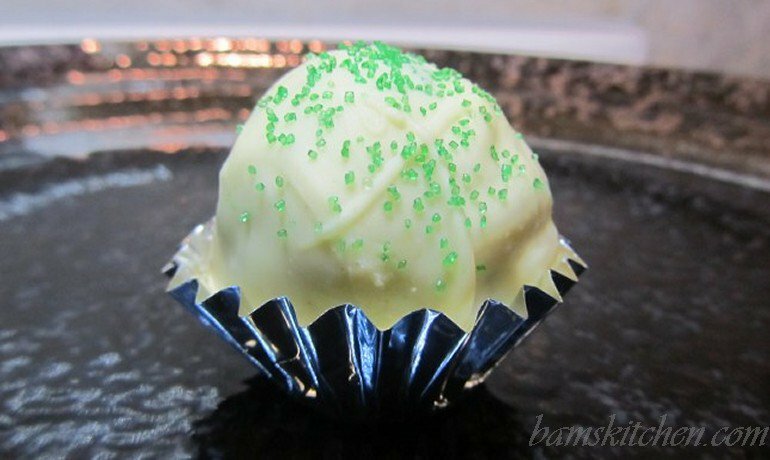 Place one Oreo ball on a fork and drizzle the white chocolate over the top making sure that it is completely covered. 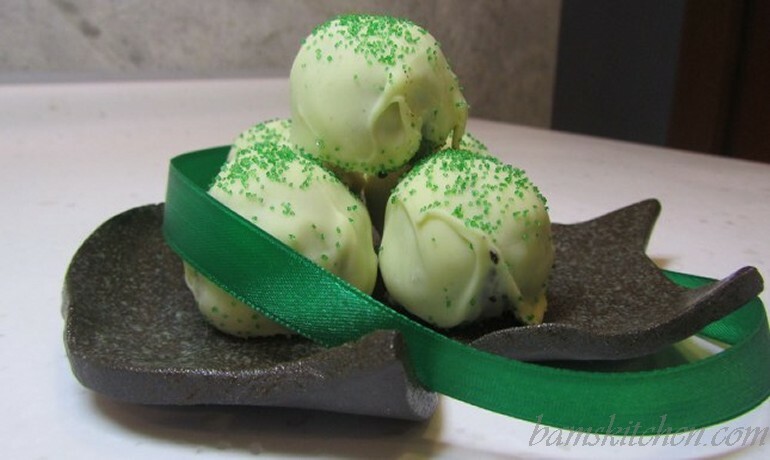 Set the chocolate covered ball on a parchment paper lined tray and sprinkle with Green sprinkles. 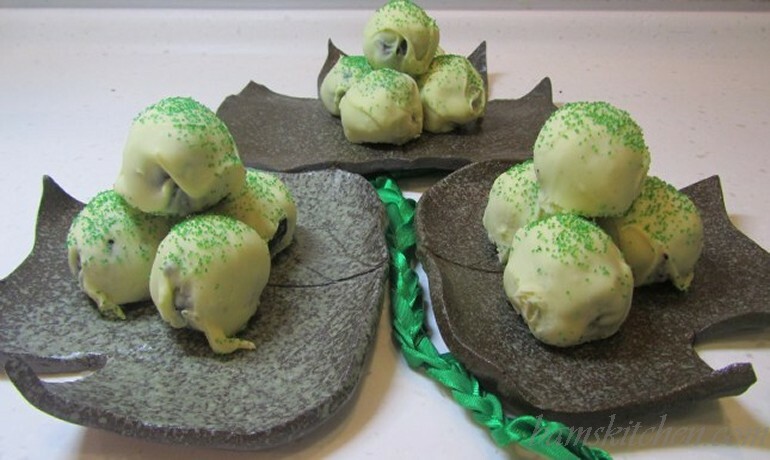 Repeat process with the rest of the Oreo balls. Step 6: Store in Refrigerator in a Tupperware or in freezer for longer storage options. 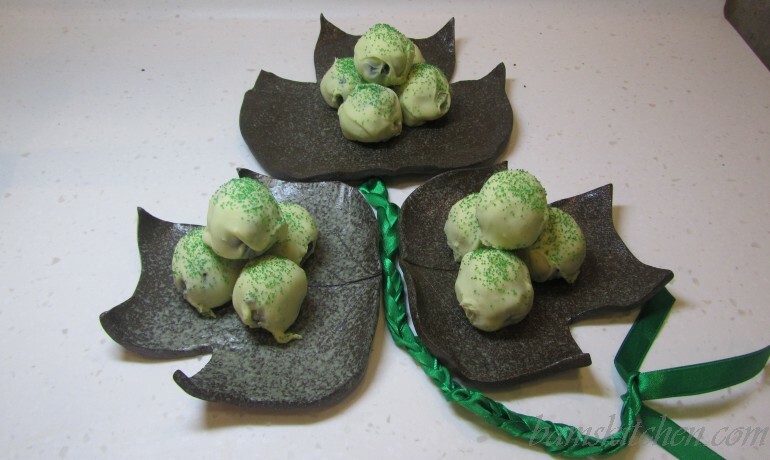 Step 7: Enjoy Shamrock Oreo Truffles with a big glass of milk or maybe an Irish coffee.